Enjoy the sound of the ocean. Southern California beach camping is a great way to enjoy the relaxing sounds of the ocean. Watching the sun set over the water is a beautiful way to end your day. You can experience all of this by camping at some of California's state beaches. California state beaches are great places for beach camping. Sites usually range in price from $39 to $44 and offer showers and restrooms. Various activities can be enjoyed at California's beaches like fishing, surfing, bike trails, tide pooling, and hiking. Reservations can be made online at Reserve America or by calling 1-800-444-7275. You can make your reservations up to seven months in advance. 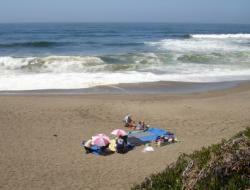 Following is information on some prime California state beaches where you can enjoy your next camping trip. Only self-contained RVs are allowed, no tents. You can check in after 2:00 p.m.
Doheny has been rated as Orange County's best camping site for the last 13 years. You can enjoy surfing, fishing, swimming and bike trails. In addition, you can enjoy various programs that are available throughout the year. Seacliff is known for its concrete freighter, the Palo Alto. While this ship is closed to the public, you can still enjoy the fishing pier as well as hiking and guided tours. Only camping in RVs is permitted. Another great state beach, South Carlsbad offers skin diving, surfing fishing and more. Showers are operated by tokens that you can get from token machines and upon check in. WiFi is also available for your convenience. If you enjoy diving or snorkeling, you will love the reef at San Elijo. Camping here is safe thanks to the Campground Watch program. 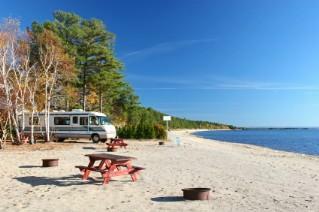 Your family will enjoy various beach activities as well as the Campfire Programs and Nature Walks. This beach also has WiFi available. If you enjoy primitive camping, Channel Islands is the place for you. For $15 you can reserve your site up to five months in advance. After you boat to the islands, you must carry your gear to the campsite as there is no transportation on land. You will need to bring your own water as well as pack out your trash. In addition, no fires are allowed so be sure to bring your gas camp stove. Disneyland--Two great theme parks, Disneyland Park and Disney's California Adventure will thrill your kids and make you feel like a kid again. Knott's Berry Farm--Enjoy the rides and attractions like the Sierra Sidewinder rollercoaster. Universal Studios Hollywood--Check out Universal's House of Horrors, take a studio tour, or let the kids enjoy the Nickelodeon Blast Zone. Sea World--With rides, shows and events for the whole family to enjoy, you can't miss this when you visit southern California. With so much to do and see, southern California is a great destination for your next camping trip.